Jack was the man that got me hooked, but Arnold was the one that raised us in golf. Perhaps the thing I am most apprehensive of is to talk about the golfer. 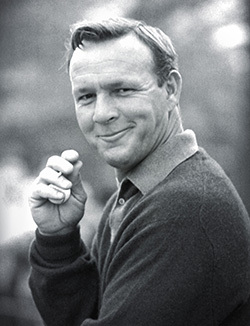 While he was a Hall of Famer, one of the greatest of all time golfers, he was a substantially better human being. He turned a tiny little hospital into a world renowned children's hospital. Having spent the last 6 years of my life in Orlando, I became very fond of the city and the people that reside there. While Orlando may be known for Disney World, I really believe that Arnold Palmer put it on the map and the friendly nature of the people is a direct result of Arnold's presence. It's funny because now living in South Florida I get a lot of people that put Orlando in low regard as a cheap, tourist trap. But in reality it's one of the nicest and perhaps cleanest downtowns I've ever seen for a major metropolitan city. And when the shootings happened earlier, I was afraid that things would turn ugly since the victims were almost all LBGT. And not only did I hear almost nothing that was homophobic or anti-LBGT, but the support was overwhelming for the victims and their families. And in the end, the hospital decided to not charge the victims of that senseless, awful crime. And I really believe it all started with Arnold Palmer. The very next day it was announced by Berman that the 'Arnie's Army' name was to stop in fear of offending the real Arnie's Army. And this was a man that hadn't won a PGA Tour event since 1973. And it wasn't that the real Arnie's Army was 'offended.' They just wanted to let Berman and ESPN know....there's only 1 Arnie's Army and don't you forget it.